Advancing Macomb is a collective of community leaders working to advance Macomb County. Twenty years ago, when others were building communities geographically far away from the urban center, Melissa Roy swam against the tide, and moved right into the city of Detroit. Today, as people increasingly move to Detroit, they recognize Roy as a pioneer and they congratulate her on her real estate prowess. While Roy does not take credit for the ability to predict the eventual rise of Detroit and the increase in property values in the city, she does acknowledge her steadfast faith in the community. And she encourages people, wherever they live, to stand their ground, get involved, and work to fix whatever is wrong in their communities. This was her message to members of Advancing Macomb, a nonprofit community development organization based in Mount Clemens. 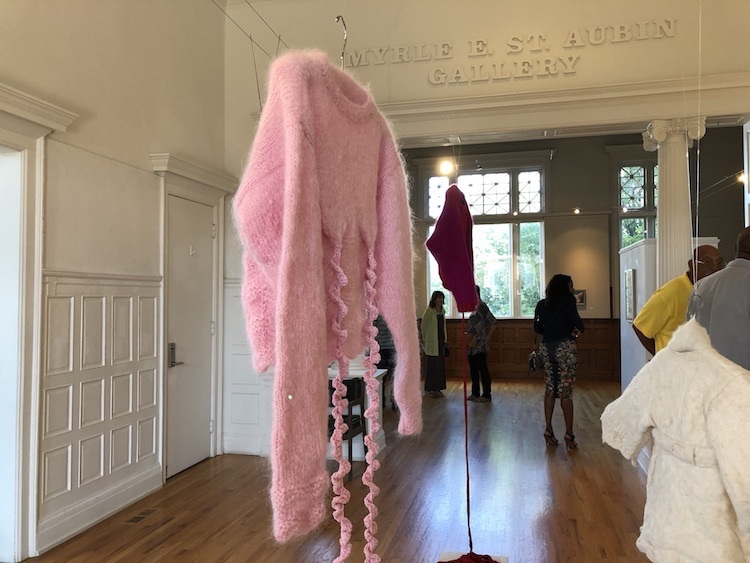 The group met in August at Anton Art Center, in a wing dedicated to an art show called “Motherhood.” Among photos of women hanging laundry with children clinging to their backs and knitwear evoking the many labors and joys of mothering, community members connected to advance business growth and nonprofit community projects in Macomb County. Advancing Macomb was founded more than three years ago to leverage business and community leadership, provide a unified voice for advancing Macomb County’s assets, and build a community investment fund for community, economic, and natural resource development. The group represents educational institutions, employers, and principal business organizations within Macomb County. Advancing Macomb met at Anton Art Center in Mount Clemens, in the midst of an art exhibit called "Motherhood." Specific to Mount Clemens, Roy shared an overview of some smaller projects Advancing Macomb completed, like a kayak and canoe launch in MacArthur Park, and the successful grant application to the Ralph C. Wilson Foundation’s Play Everywhere Challenge for an interactive mural installation in Mt. Clemens. “We shared these projects with our board, and they said Mount Clemens is an imperative for this county, It’s an imperative for our community, an imperative for our economic health and an imperative for our future,” says Roy. The event highlighted the potential for entrepreneurial growth in Mount Clemens, an effort in which Advancing Macomb sees itself as an interested party. That’s a big reason Michelle Weiss, marketing coordinator with the City of Mount Clemens Downtown Development Authority, attends Advancing Macomb events. She’s working to garner interest in the Nest Collaborative, a women’s retail business incubator. In addition to offering space for small businesses to create and sell their products, Nest holds workshops, which are open to the public, on topics such as business planning, social marketing, human resources, and website design. Weiss said she wants to spread the word about Nest, and help Macomb County businesses support the initiatives within the collaborative. 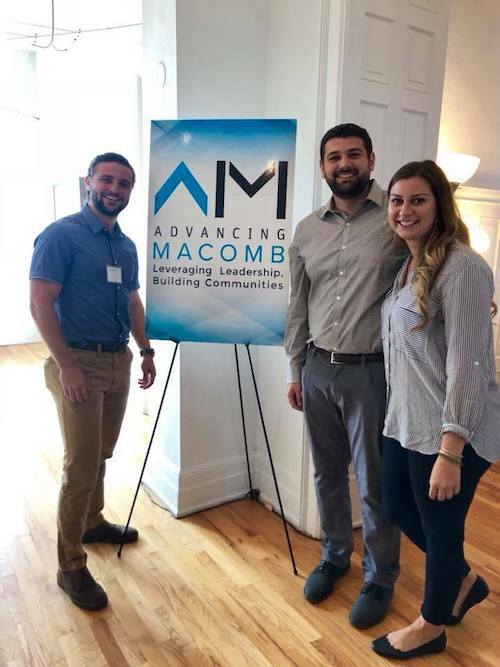 Zuhair Issa, Mehmed Muharemovic, and Emina Alic of LK St. Clair Soccer, Inc.
Like Weiss, Zuhair Issa attended the Advancing Macomb event to spread awareness of his own initiative, amatuer men’s soccer club LK St. Clair. Issa, co-founder and head of PR for the club, is working to create a business that can benefit all of Macomb County, modeled after Hamtramck-based Detroit City FC. Eventually, the club would like to have a permanent field in Macomb County to host games and events, and run a youth soccer program. Ja’Waun Hodges wants to make as many connections as he can in his hometown of Mount Clemens. A recent graduate of Central Michigan University, Hodges founded his investment company Smart Capital, and built a partnership with the Mount Clemens dry cleaning business he worked for since high school. Then he purchased a Clinton Township home, fixed it up, and is renting it to tenants. Hodges says he knows Macomb County, and Mount Clemens in particular, are on the rise, and he wants to be part of the boom.